With huge awards and achievements, Joe is the makeup designing mastermind behind hit productions Wicked, Grease!, Follies and many more. He's recently begun to share his talent through theatrical makeup master classes, after fifteen years of freelance, work at MAC, runway shows, makeup for TV appearances and broadway makeup. If all of that artistic experience wasn't enough, Joe is also a fine artist and photographer in his spare time. Recently, I've had the pleasure of being in contact with Joe and arranged an interview about all things makeup. His wisdom and experience of the industry shines through in every response. 01- What made you want to get in to the makeup industry? I always loved makeup as a kid. I loved watching old monster movies like Dracula and Frankenstein and wanted to do that makeup on me. I did a lot of theatre when I was growing up (acting) and so would practice doing makeup on myself or my young nieces. I love being able to create a character and dressing up in costume. 02- Which brand of makeup do you predominantly use? I use a lot of different brands. MAC eyeshadows and blush, Make Up For Ever HD Foundations, powder, flash color palettes, Temptu airbrush makeup, Graftobian creme foundations, Ardency Inn foundations (my new fav), Obsessive Compulsive Cosmetics (amazing loose pigments, liners and lip tar), Ellis Faas concealers, Cozzette brushes, Crown brushes. I think it's important to branch out and use different brands. You get different pay offs with different lines. Of course MAC still has my favorite shadows. 03- Out of your work, what looks are you most proud of? I love my design for Madame Morrible in Wicked. It probably is my favorite character I have ever designed. I like that the makeup can transform as the actor transforms their character. And there is only one small change in the makeup as well. Also overall, I love my design for Follies, that starred Bernadette Peters. 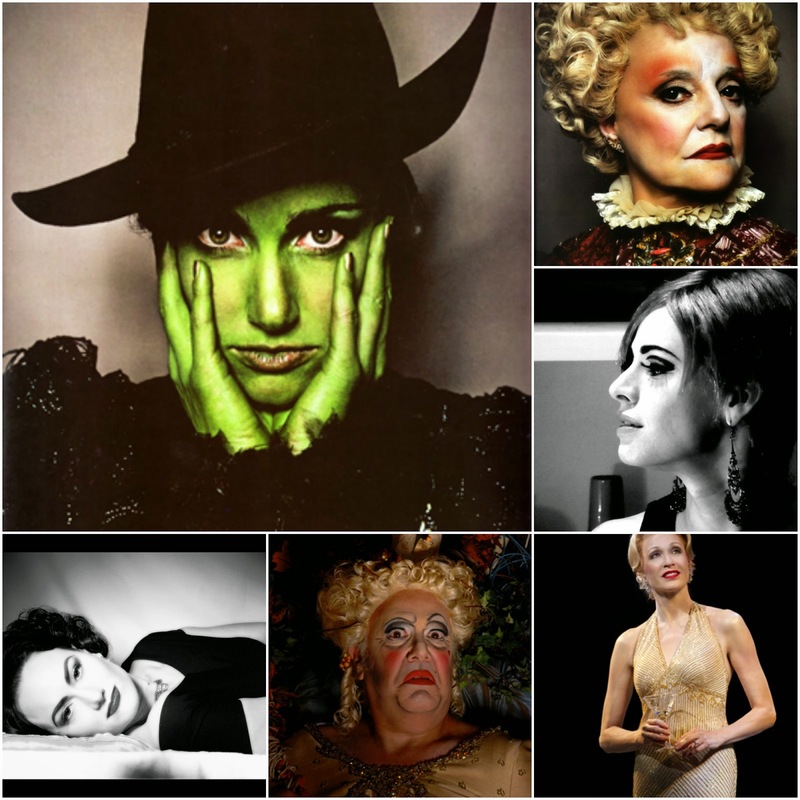 It was such a creative high for me to be able to design makeup for all these amazing women and have it set in 1971. I had to decide if the characters would be current with makeup in the early 70s or whether they would still be a throwback to when they were a star in the Follies. Then I also got to design the ghosts of these ladies, all played by younger women. I had to make them look period (early 1900s through 1940s) and yet make them look ghost like. 04- What is one piece of advice you would give to someone wanting a job similar to your own? RESEARCH! When you get a job, you need to know the time period, the style, etc. of the makeup. Find as many reference pictures as you can, and knowing that sometimes there are multiple styles of makeup during that time period, depending on who the person is. Be knowledgeable about it, so that you can back up your work. But also know that you will have to adjust it to make it work for stage. You can't do a straight period makeup and expect it to read perfectly on stage. So sometimes you have to alter it so it looks right to the audience, yet still looks period. 05- What's one thing you wish you'd learned sooner than you did about makeup? I wished I had learned to be confident in myself and my work. I think I learned that long after I should have. And that is another piece of advice. Confidence. If you are confident, employers will like that. If you make a mistake, don't make a big deal out of it, just fix it and move on. It shows you to be reliable and knowledgeable about your work. 06- What's the first thing you consider when you're about to design a look? There isn't just one thing. I consult with the costume designer and find out time period, feel, theme of the show. Then I find out about each character individually. You need to take all aspects into consideration before starting your design. If you just focus on one thing you will lose so much in the design and it won't be correct for the show. Huge thanks to Joe for lending me his artistic expertise for this post, and for all of the great advice that I'll hold on to.